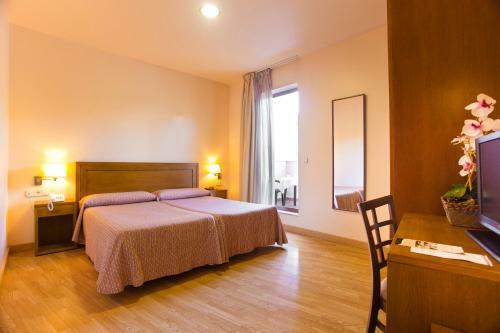 Set in Centro, the Hotel Granada Centro is close to the Monastery of Saint Jerome and offers a 24 hour reception, family/oversized rooms and a hair salon. The hotel provides a concierge service, along with car hire and bicycle rental. The hotel also offers porters, luggage storage and multilingual staff. The hotel also has ski lockers during the ski season. The Hotel Granada Centro provides air-conditioned rooms, perfect for travellers on a budget. A hair dryer, a private bathroom and tea and coffee making facilities can be found in each room of the hotel. A ceiling fan, a flat-screen TV and wireless internet access are also on offer in every room. The Hotel Granada Centro's district is a popular nightlife destination and you'll be spoilt for choice deciding on which place to go. Located just a stone's throw from a range of popular hot spots, the hotel is in close proximity to a number of bars, nightclubs and fashionable restaurants. Royal Chapel of Granada, Granada Cathedral and the Madrasah of Granada are within a quick 10 minute walk of the hotel. This hotel is 1666 metres from the Alhambra entrance, 629 metres from Plaza Nueva (the absolute centre of Granada), 970 metres from the train station and 2367 metres from the bus station.